The SF Giants will be in Bud Selig's hometown of Milwaukee this weekend for a three-game series against the Brewers. As we all know, Barry Bonds now needs two home-runs to tie the all-time record and Selig still has not said whether he'll be in the ballpark when the record is broken. I can't stand Bonds and I'm really upset that he's the one that's going to break this hallowed record. 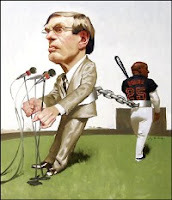 However, as I've said in the past, there's nothing anyone, not even Selig, can do about it. No one spoke up about steroids a decade ago and this is the price everyone has to pay. If Selig hasn't made up his mind by now whether or not he'll be in the ballpark, Bonds might make it up for him if he hits homers 754 and 755 before the series ends. Not being in his hometown ballpark at that point would make Selig look like a foolish child. Bonds is well-rested going into this series. Looks like your weekend plans include a trip to Miller Park, Bud.